Watercolour drawing dated 5 May 1801, of a figure of Durga carved on a stone tablet at Siruvolal (?) 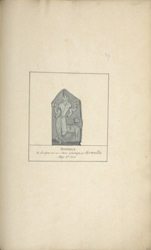 in Karnataka, from an Album of 56 sheets of drawings (60 folios) mainly of miscellaneous architecture and sculpture in the Deccan and S. India, dated 1793-1806 from the Mackenzie Collection. Durga is one of the many names of the goddess and a manifestation of Shiva's consort and has two aspects: one is merciful and benevolent and the other is ferocious and punishing. She is said to have been created by the gods to kill the buffalo-demon Mahisasura who had usurped their position. She is represented in this drawing standing with her vehicle the lion.